PERPETUATE the “Community Band” tradition and spirit in central Arkansas. The Hot Springs Community Band organization can trace its musical heritage to 1975 when twenty local citizens formed the CSO Senior Citizens Band under the direction of John Melton, a retired Indiana high school band director. Later, as the band evolved and younger members joined, the name was changed to the Hot Springs Community Band. In 2005 the name of the band was again changed to the Hot Springs Concert Band to better reflect its expanded repertoire, membership and role in the musical life of the region. In ca. 1998 the New Horizons Band was formed as a musical ensemble of the Hot Springs Community Band organization and offer an opportunity for musicians who have been away from playing their instrument for years to "pick up their horn" and begin playing again. Offering side-by-side instrumental instruction as well as performance opportunities, the New Horizons Band opens doors to new and previously inactive musicians in the area. For more information on the New Horizons national and international movement, please continue reading by clicking on the link below. Established in 1975, the award winning Hot Springs Concert Band has grown from twenty local residents into a 70-member band – the largest community band in Arkansas rehearsing and/or performing year round. Its members come from seventeen communities in Central Arkansas, some driving 70 miles each way to rehearsals and performances. Current members range in age from teenagers to octogenarians. This age diversity brings to the band a wealth of talent and performance experience ranging from eager amateurs to currently working or former professional musicians and educators. THE HOT SPRINGS CONCERT BAND performs four indoor and five outdoor concerts annually; audience sizes range from 650 (indoor and formal) to 1,100 (outdoor and informal in Hot Springs National Park) for these concerts. Each 90-minute concert has a theme, and the music is selected accordingly. The HSCB has earned the coveted Hot Springs’ “Tourism Organization of the Year” award. The HSCB has commissioned three pieces, performed at two U.S. Naturalization ceremonies, played for Hot Springs National Park’s 175th anniversary, and hosted three national band conventions; it also sponsors a bi-annual national composition competition and an annual student scholarship program. With a very active performance schedule, the Hot Springs Concert Band offers something for all musical tastes. Musical selections vary from lighter fare served with the Summer Park Series to more serious concert works performed during the winter season. To support this wide range of musical styles, the band and its affiliate organizations enjoy a membership of over 100 area musicians from more than ten communities in Central and South Arkansas. Musicians may participate in a variety of musical groups under the auspices of the main organization, which include The Hot Springs Concert Band and The New Horizons Band. The Hot Springs Concert Band has been the subject of a program on Arkansas Public Radio that showcased the community band as part of the state's artistic life. On July 29, 2009, the band did a repeat performance at the Arkansas Bandmasters Association summer convention in Little Rock at the Doubletree Hotel. 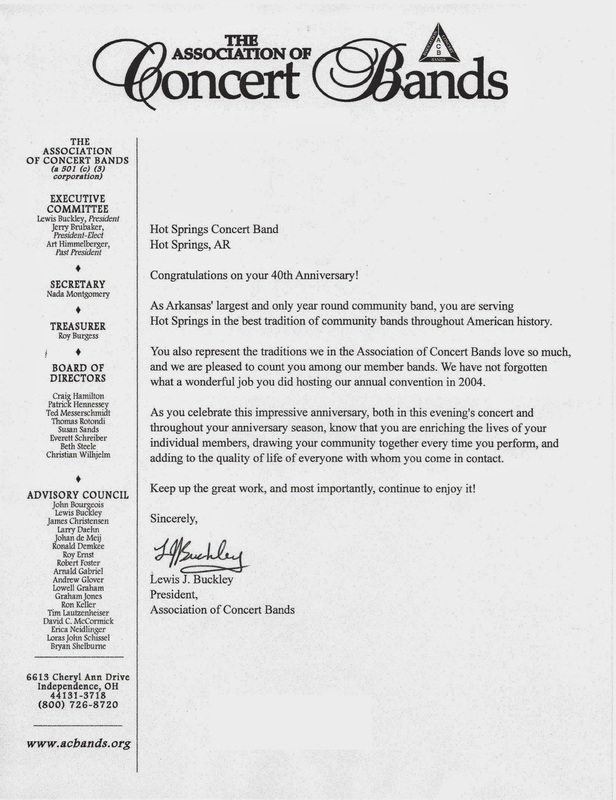 ​HOT SPRINGS CONCERT BAND receives special recognition from the ACB upon the 40th anniversary of the Hot Springs Community Band organization. 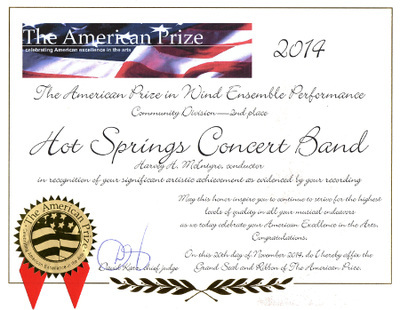 HOT SPRINGS CONCERT BAND achieves 2nd place nationally in The American Prize competition. The HOT SPRINGS CONCERT BAND, Craig V. Hamilton, director, of Hot Springs National Park, AR, has achieved 2nd place nationally in the community band division of The American Prize competition, 2014. The band was selected from applications reviewed this summer from all across the United States. The American Prize is a series of new, non-profit, competitions unique in scope and structure, designed to recognize and reward the best performing artists, ensembles and composers in the United States based on submitted recordings. The American Prize was founded in 2009 and is awarded annually in many areas of the performing arts. In July of 2005, The Hot Springs Concert Band was honored with an appearance at the Arkansas Bandmasters Association summer convention in Little Rock. Dr. Hamilton took advantage of the occasion to showcase the merits of a community band as a venue for Arkansas students to continue performance experiences through their adult years. The band has also been the subject of a recent program on Arkansas Public Radio that showcased the community band as part of the state's artistic life. Membership to the Hot Springs Concert Band is determined by audition and instrumentation needs. Rehearsals are every Thursday from 7-9 p.m., unless stated otherwise. Some previous musical experience and skills is mandatory. Rehearsals are in the National Park College Student Center. Those able to participate on a seasonal basis are also welcomed, such as student musicians who are home for the summer months. A membership dues in the amount of $30 is paid at the beginning of the spring, summer and fall semesters. For more information, please call 501-922-8641 or complete and submit the contact form below:.